Written exam results have been declared for TNPSC VAO Exam. Candidates who had appeared for the Village Administrative Officer examination same can now check their result at tnpsc.gov.in. Tamil Nadu Public Service Commission (TNPSC) has declared the written exam result (Phase 1) which was held as a part of recruitment for Village Administrative Officer post. The examination was held on 28 February 2016. Hereafter the Commission will conduct counselling for all the selected candidates from 19 December till 23 December at the Office of the Tamil Nadu Public Service Commission, Frazer Bridge Road, Chennai - 600 003. Individual intimation regarding the date and time of the Counselling will be sent to the candidates separately. It is to remind candidates that the certificate verification to verify and confirm the genuineness of candidates’ claim in the online application was held from 01 August till 08 August. Applications were invited for the post of Village Administrative Officer in the Tamil Nadu Ministerial Service, 2014 – 2015. Candidates should note that the admission of candidates for Counselling is purely provisional subject to the outcome of OAs/WPs if any on the files of the Hon’ble High Court, Madras/Madurai Bench of Madras High Court relating to this recruitment. 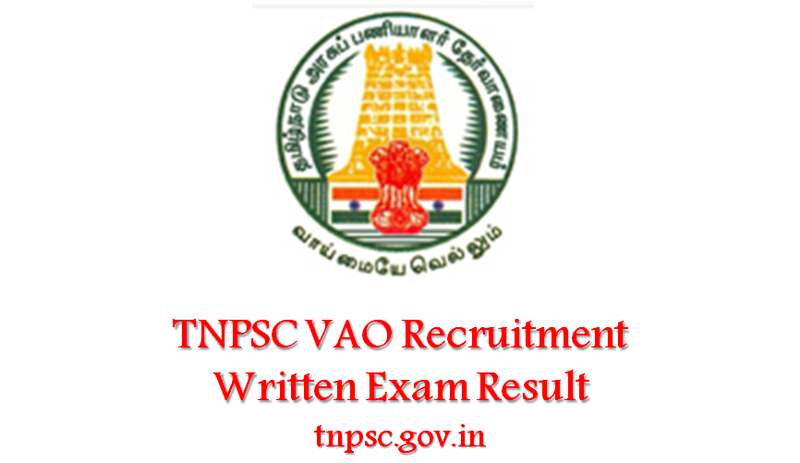 About TNPSC VAO Recruitment Exam: Tamil Nadu Public Service Commission (TNPSC) had invited applications for 813 Village Administrative Officer Posts in December 2015. Applications were invited from those candidates who have passed S.S.L.C Public Examination or its equivalent with eligibility for admission to Higher Secondary Courses of Studies (or) to College Courses of studies. Adequate knowledge of Tamil was also an added criteria. Important Note: The admission of candidates whose Register Numbers are found in the list is based on the particulars furnished by them in their online applications such as age, educational qualification, community, etc., subject to verification/ acceptance of certain documents, educational qualification possessed by him/her, clarification regarding community status and its acceptance, etc. as the case may be, wherever necessary. If any of their claim is found to be false or incorrect, their candidature is liable for rejection at any point of time.